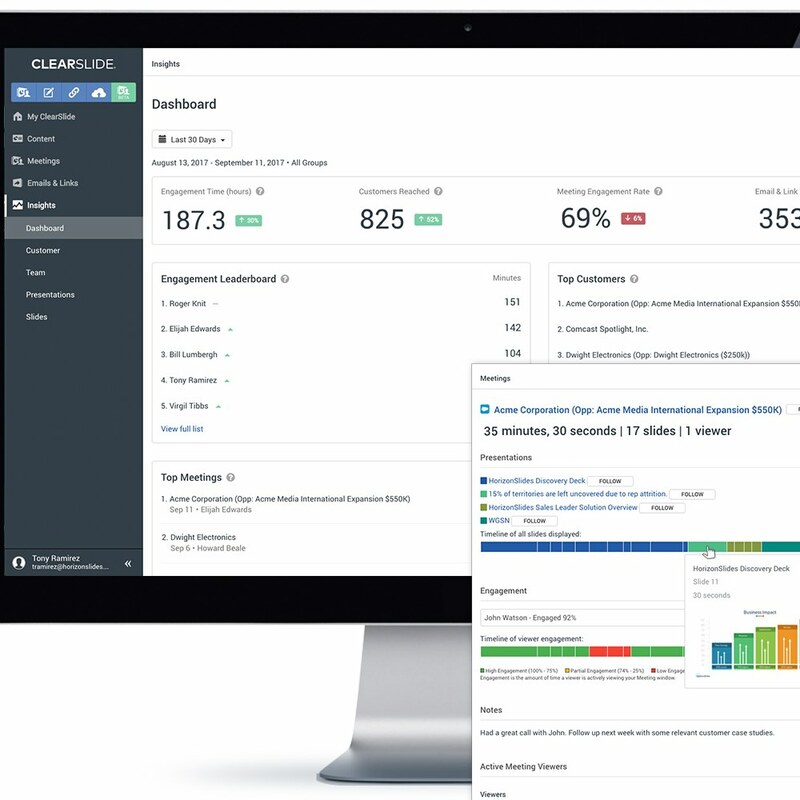 ClearSlide enables Marketing and Sales teams to send and track emails with robust customer engagement analytics from your email platform of choice. From 1:1 communications, micro-campaigns, and larger email blasts, ClearSlide email is fully integrated with a single content library so reps are armed with the best content at the right sales stage. Trackable emails provide instant notifications when customers engage with sales content, as well as slide-by-slide, second-by-second analytics showing how viewers engaged with the content – including when content is forwarded. Detailed activity and engagement information is auto-logged back to lead, opportunity, account, and custom fields in CRM. Immediately tailor follow-ups based on the viewer’s email engagement and take the next action from within ClearSlide – whether that’s another email, instant meeting, or scheduled follow-up.In addition to using the ClearSlide web app, users can create and send emails and recommended content via Outlook and Gmail plug-ins, ClearSlide mobile apps, and directly from CRM. Easily access the ClearSlide email template library. Templates are integrated with content so you always have the right message at your fingers for any communication. 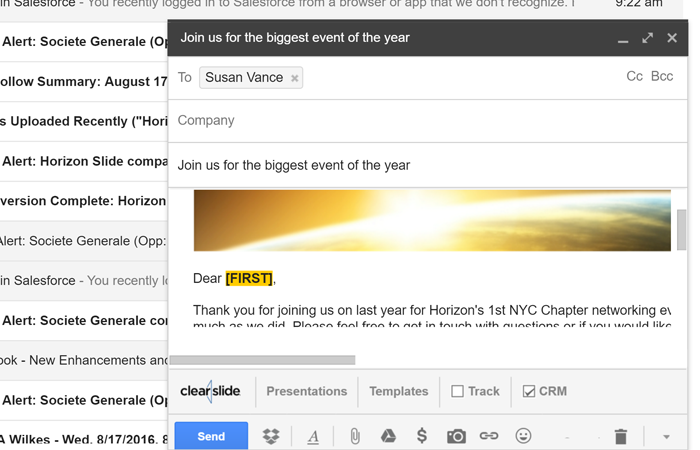 Trackable emails can be created individually or via pre-existing templates. 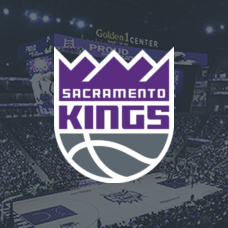 Reps can automatically update sent links when content is updated – and can control content by collecting viewer contact information, limiting forwards, restricting downloads, and setting content expirations. 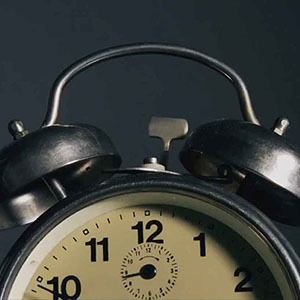 Sales reps receive real-time alerts of email metrics (opens, clicks, etc.) 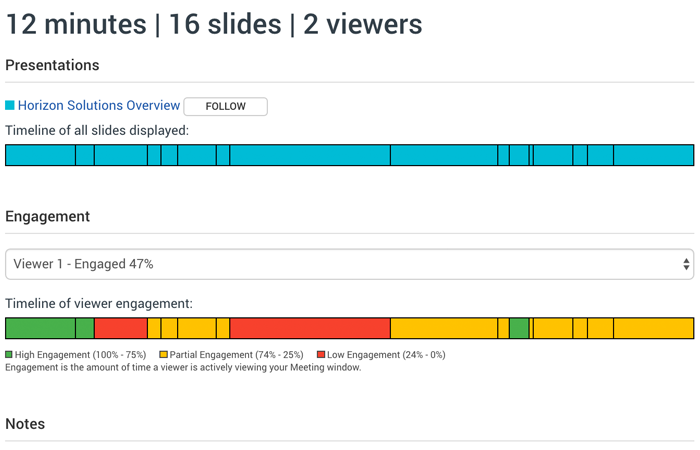 and detailed email content engagement (page-by-page analytics) to prioritize and customize follow-up. Notifications of email forwards, providing visibility into how the content is diffusing throughout the organization. Engagement analytics provide the insights needed to scale what’s working or how to adjust messaging or target audience beyond standard email tracking – to drive results. ClearSlide offers robust functionality for reps to create templates for personal or shared use. Or, Marketing can provide templates and recommended content. Large email blast capabilities and scheduling features allow reps to scale outreach while using approved messaging. Move faster in initial outreach –and use activity and engagement notifications to prioritize lead follow up and yield higher connect rates. Outlook and Gmail plugins make it even easier to work from your inbox – with the integrated ClearSlide content library, robust template functionality, and all activity and engagement auto-logged back to CRM. 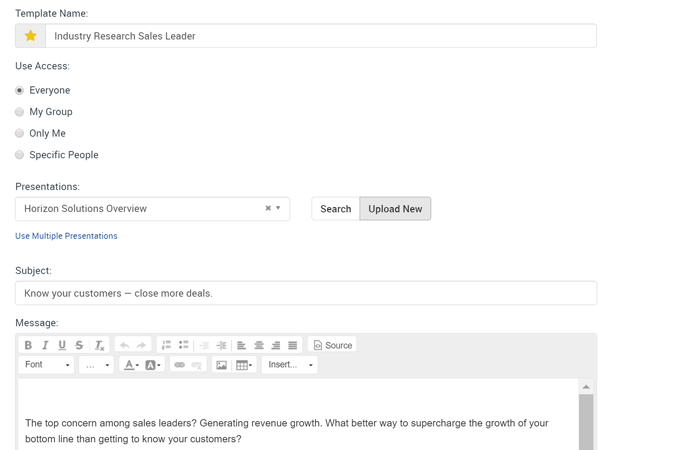 Reps can customize lead views and execute micro-campaigns without leaving CRM. Track campaign progress in CRM based on activity engagement analytics and further tailor your outreach.